The human body is a self-organising system that builds its own parts. Your nervous system evolved in nature over hundreds of millions of years. It comprises your brain and spinal cord, 70km of nerves and more connections than stars in our galaxy. Starting just 3 weeks after conception, it’s the first system to appear in the developing human. Your thoughts and actions, the way you look, move and feel all reflect the integrity of your nervous system. Organising every process in your body, it really is the foundation that determines the quality of your life. foundation for building a better life. Self-organisation is the ability to automatically balance, align and stay in tune. It requires being able to respond to any challenges in your current surroundings. When your nervous system detects a challenge it activates a response to cope, until the situation has passed. For example, when you are cold you shiver to create body heat, and stop once you’re warm again. This is a normal and healthy response. The most intense of responses are the fight-flight and freeze stress responses. Ancient stress responses that evolved as short-term survival strategies actually become harmful if activated for weeks, years, and decades. Whether it’s a cold night or being attacked by a tiger, you only evolved to cope with short-term, natural stresses. It’s essential these responses only activate when appropriate and switch off as soon as possible. Modern daily life presents many physical, chemical and mental-emotional stresses that overpower, exhaust or confuse your stress response. Leaving them over-activated and switched on way past their use-by date. We evolved for the Jungle, but we live in a Human Zoo. Long-term stress responses stop your nervous system and body from finding balance. You become locked in a constant sub-optimal state. Eventually your nervous system and body shifts and this sub-optimal state become the new ‘normal’. This is a Neuro-Structural Shift. 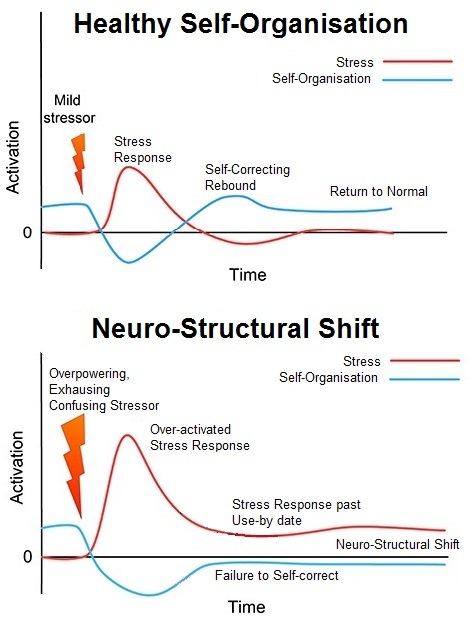 Neuro-Structural Shifts affect the behaviour and perception of the nervous system and the structure and function of the body. Neuro-Structural Shifts compromise health, eventually leading to a myriad of Secondary Conditions and sabotaging the life you really want to live. Think of your nervous system as the foundation for a building. If the foundation is off, the floors will constantly creak, doors won’t close properly, there’ll be cracks in the walls and the building will collapse before its time. You can spend time and money patching up and fiddling with the secondary problems, but in a short time all the problems will have to be repaired again and again. We don’t do patch up jobs at Foundation.